I've got a Ruckstell in the '23 Model T I bought a couple weeks ago. I have the "Ruckstell operating manual" & the "Repairing & Restoring" book coming. In the mean time I'm wondering if the babbitt thrust washer age issue with original Ford rear ends is the same with the Ruckstell rear ends? The parts catalogs seem like the thrust washer parts are different between the two? To be honest from all that I've read I'm a little hesitant to throw all my kids in & go for a drive until I know more information. Only one thrust washer in your Ruckstell, a ball bearing is on other side. "Only one thrust washer in your Ruckstell, a ball bearing is on other side. But there IS one thrust washer and you should check that it has been replaced with a bronze one". It is probably a good idea to check the washer but the Ruckstell thrust is taken by a ball bearing. If the babbitt washer is entirely gone the ball bearing will continue to control the thrust under acceleration and deceleration. 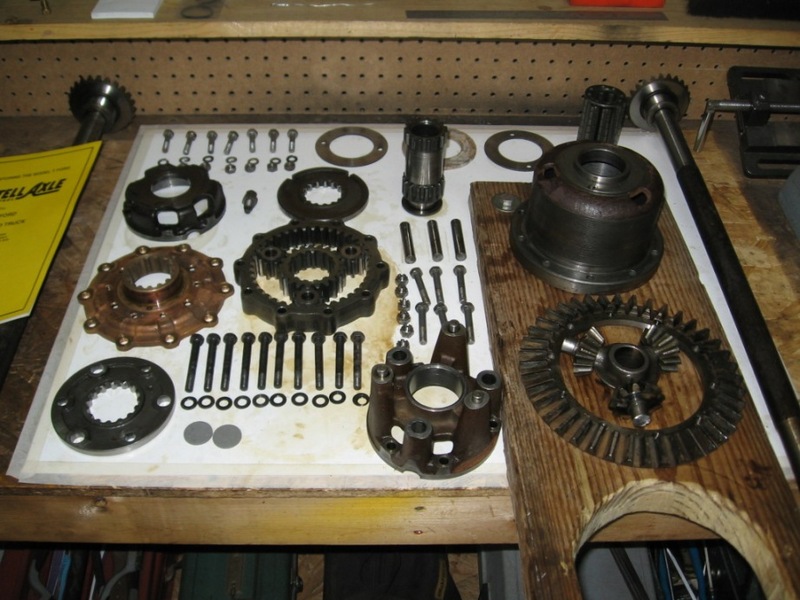 It may be noisy and add to the wear of the ring and pinion but it cannot skip over the teeth of the ring gear if the ball bearing is doing its job or the ring and pinion gears are worn down to just nubs. Can you look at the thrust washer with a scope camera? Or do you have to take it apart? You can look at the thrust washer with a borescope camera, but that is only one of a dozen things that can be very dangerous in the rear axle. Your pinion bearing is another failure prone item. Only one way to see it is to take it apart. A bad pinion bearing can kill you. The driveshaft forward bushing is another typical problem. Inner and outer wheel bearings are also very dangerous if they fail. None of these things are visible without disassembly. Thanks Royce! I'm going to take it apart. I think it was already done because with the boxes of parts I saw the old "roller"? bearings and boxes of the new stuff that wen in. Unfortunately you never know. With the plug removed, you can probably get a scope thru the oil hole. A lot has been discussed about thrust washers, but I've reused originals if they are pristine, at least on the passenger side which is not as critical. That being said, many if not most, are corroded or crumbly and should be replaced. If you do replace it, mic the original and turn the new one to the same thickness so the ring and pinion gear mesh remains the same. Good luck. Good decision! If everything looks good after you take it apart, that's a bonus and you learned a lot. I bought a Ruckstell on Ebay that had been "gone through", but on Stan's advice I took it all apart anyway. Most of the parts were good, but it still had a Babbitt thrust washer and the ring gear was toast. On Stan's advice, I replaced the planetary gear pins, the original Ruckstell ball bearing with the modern equivalent, and replaced the original pinion bearing with the Fun Projects modern setup. I also drilled extra holes in the bronze bearing support plate for better lubrication. I also replaced all of the special ring gear bolts with brand new ones - those bolts are highly stressed. Do you have an auxiliary brake system on the car? If not, you need to install one. Be sure to get a copy of the MTFCA Ruckstell book before you start. Good luck, take and post pictures of the teardown and rebuild!